It’s the most fun you can have with a radio. It’s a way to talk to people around the world, or even orbiting the world; to send e-mail without any sort of Internet connection, and to keep in touch with friends while you’re driving around town. But it’s also a very important communications system — when cell phones don’t work, regular phones don’t work, the Internet doesn’t work, ham radio works. When other systems are down or overloaded, ham radio still gets the message through. Ham radio is a “hobby” – that’s the fun part that gets most people interested and keeps them on the air. But it’s also a “service” -a vital service that has saved lives again and again when regular communication systems failed. “What is ham radio? It’s the world’s greatest hobby that can save lives. It’s a hobby that instantly turns into a life saving service whenever there’s a disaster or large-scale emergency. On September 11th, it was ham radio that kept New York City agencies in touch with each other after their command center was destroyed. When hurricanes like Katrina, Rita and Wilma or tornadoes or floods knock out other communications, ham radio provides vital life-and-death capabilities. But 99% of the time, hams do what they do because it’s just plain fun. 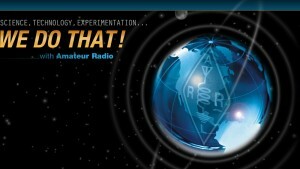 This unique mix of fun, public service and convenience is the distinguishing characteristic of Amateur Radio. Although hams get involved in the hobby for many reasons, they all have in common a basic knowledge of radio technology, regulations and operating principles, demonstrated by passing an examination for a license to operate on radio frequencies known as the “Amateur Bands.” These are reserved by the Federal Communications Commission (FCC) for use by hams at intervals from just above the AM broadcast band all the way up into extremely high microwave frequencies. Amateur Radio operators come from all walks of life — movie stars, missionaries, doctors, students, politicians, truck drivers and just plain folks. They are all ages, sexes, income levels and nationalities. But whether they prefer Morse code on an old brass telegraph key through a low-power transmitter, voice communication on a hand-held radio or computer messages transmitted through satellites, they all have an interest in what’s happening in the world, and they use radio to reach out. What’s the Appeal of Ham Radio? Some hams are attracted by the ability to communicate across the country, around the globe, even with astronauts on space missions. Others build and experiment with electronics. Computer hobbyists enjoy experimenting in wireless digital communications. Those with a competitive streak enjoy “DX contests,” where the object is to see how many stations in distant locations they can contact. Some like the convenience of a technology that gives them portable communication. Others use it to open the door to new friendships over the air or through participation in one of more than 2000 Amateur Radio clubs throughout the country. Nobody knows when Amateur Radio operators were first called “Hams,” but we do know that Amateur Radio is as old as the history of radio itself. Not long after Guglielmo Marconi, an Italian experimenter, transmitted the Morse code letter “s” from Poldhu, on the southwest tip of England, to St. John’s, Newfoundland, in 1901, amateur experimenters throughout the world were trying out the capabilities of the first “spark gap” transmitters. In 1912, Congress passed the first laws regulating radio transmissions in the U.S. By 1914, amateur experimenters were communicating nation-wide, and setting up a system to relay messages from coast to coast (whence the name “American Radio Relay League”!). In 1927, the precursor agency to the FCC was created by Congress and specific frequencies were assigned for various uses, including ham bands. Amateur Radio today has come a long way from these beginnings. Hams have their own satellites, chat with space stations, bounce signals off the moon and are at the cutting edge of many technologies. Computers, digital systems, slow scan television, cross-band repeaters and concepts undreamed of just a few years ago are common in the ham community. While skills in Morse code are no longer required by the FCC to get a license, many hams still enjoy and use this older mode. But while the Morse code key may be on the desk, it is probably next to a modern, transistorized system capable of operating under the most extreme emergency conditions. Although the main purpose of Amateur Radio is fun, it is called the “Amateur Radio Service” because it also has a serious face. The FCC created this “Service” to fill the need for a pool of experts who could provide backup emergency communications. In addition, the FCC acknowledged the ability of the hobby to advance the communication and technical skills of radio, and to enhance international goodwill. This philosophy has paid off. Countless lives have been saved where skilled hobbyists act as emergency communicators to render aid, whether it’s during an earthquake in Italy or a hurricane in the U.S.
That’s the definition of the word given in G. M. Dodge’s “The Telegraph Instructor” even before radio. The definition has never changed in wire telegraphy. The first wireless operators were landline telegraphers who left their offices to go to sea or to man the coastal stations. They brought with them their language and much of the tradition of their older profession. Amateurs, possibly unfamiliar with the real meaning of the term, picked it up and applied it to themselves in true “Yankee Doodle” fashion and wore it with pride. As the years advanced, the original meaning has completely disappeared. Look at the dial on an old AM radio and you’ll see frequencies marked from 535 to 1605 kilohertz. That’s the AM commercial radio band. Imagine that band extended out many thousands of kilohertz, and you’ll have some idea of how much additional radio spectrum is available for amateur, government and commercial radio bands. It is here you’ll find aircraft, ship, fire and police communication, as well as the so-called “shortwave” stations, which are worldwide commercial and government broadcast stations from the U.S. and overseas. Amateurs are allocated ten basic “bands” (i.e. groups of frequencies) in the High Frequency (HF) range between 1800 and 29,700 kilohertz, and another seven bands in the Very High Frequency (VHF) bands and Ultra High Frequency (UHF) ranges, as well as Super High Frequency (SHF) bands. Some of these ten bands are very small and some are rather large. Even though many Amateur Radio conversations may be heard around the world, given the right frequency and propagation conditions, Amateur Radio is basically two-way communication. The three best ways to learn about Amateur Radio are to listen to hams on the “Amateur Bands,” read about Amateur Radio in the numerous books and magazines devoted to the subject and, best of all, talk to hams face-to-face. Hams take pride in their ability to “Elmer” (teach) newcomers the ropes to get them started in the hobby. There is probably an Amateur Radio club near you that will welcome your interest. You can go to www.arrl.org/findaclub to locate clubs near your own home area.